Pipeline processing can occur not only in the data stream but in the instruction stream as well. Most of the digital computers with complex instructions require instruction pipeline to carry out operations like fetch, decode and execute instructions. In general, the computer needs to process each instruction with the following sequence of steps. Fetch the operands from memory. Store the result in the proper place. Each step is executed in a particular segment, and there are times when different segments may take different times to operate on the incoming information. Moreover, there are times when two or more segments may require memory access at the same time, causing one segment to wait until another is finished with the memory. The organization of an instruction pipeline will be more efficient if the instruction cycle is divided into segments of equal duration. One of the most common examples of this type of organization is a Four-segment instruction pipeline. A four-segment instruction pipeline combines two or more different segments and makes it as a single one. For instance, the decoding of the instruction can be combined with the calculation of the effective address into one segment. The following block diagram shows a typical example of a four-segment instruction pipeline. The instruction cycle is completed in four segments. 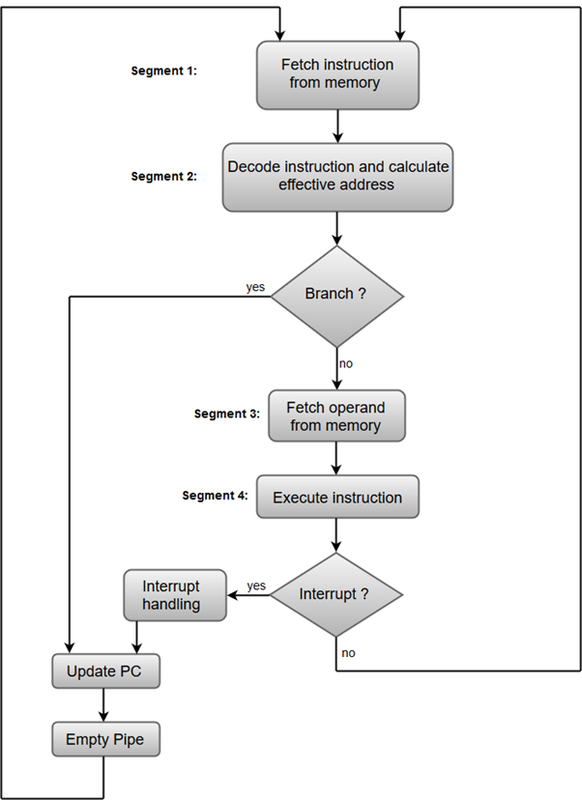 The instruction fetch segment can be implemented using first in, first out (FIFO) buffer. The instruction fetched from memory is decoded in the second segment, and eventually, the effective address is calculated in a separate arithmetic circuit. An operand from memory is fetched in the third segment. The instructions are finally executed in the last segment of the pipeline organization.